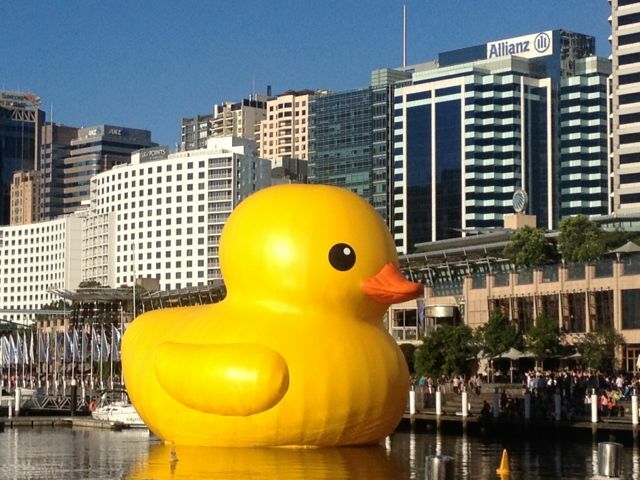 Yesterday, my friend B and I went to check out Rubber Duck at Darling Harbour here in Sydney. Rubber Duck is pretty much what you’d imagine him to be – if you have ever imagined a giant yellow duck that is five stories high and five stories wide. He is here for the Sydney Festival and has really brightened up the place. Created by Dutch artist Florentijn Hofman, Rubber Duck is part of a collection of larger-than-life urban sculptures, which Hofman hopes will “astonish audiences and give them a new perspective on public spaces”. 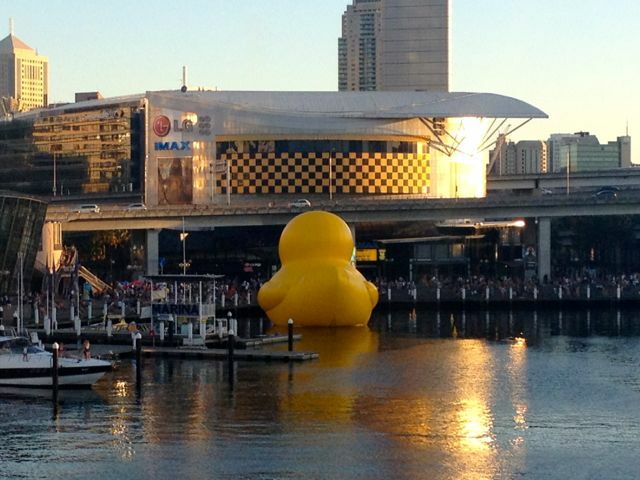 Pic taken by my friend Jane as Rubber Duck arrived in style (with a little help from a tug boat), swimming through the open bridge at Darling Harbour on Saturday. 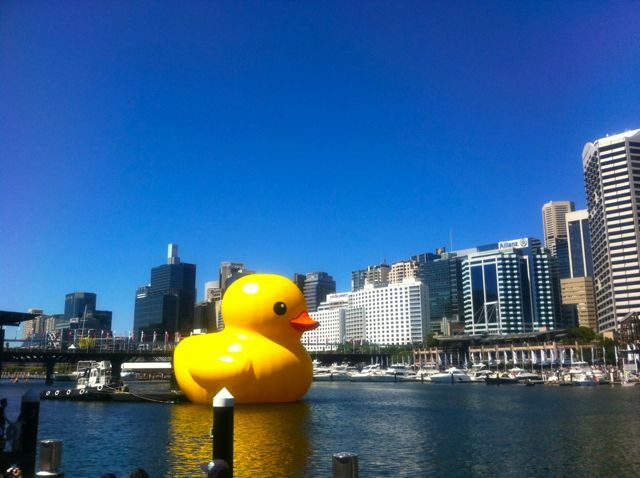 Rubber Duck, at home in Sydney. Mission accomplished with your Rubber Duck, Mr Hofman. You’ve said that his purpose is “to do no more than amaze” and while he amazes, he also puts goofy smiles on visitors’ faces as they enjoy his sunshine-bright yellowness and the memories he stirs – mostly of Ernie from Sesame Street. 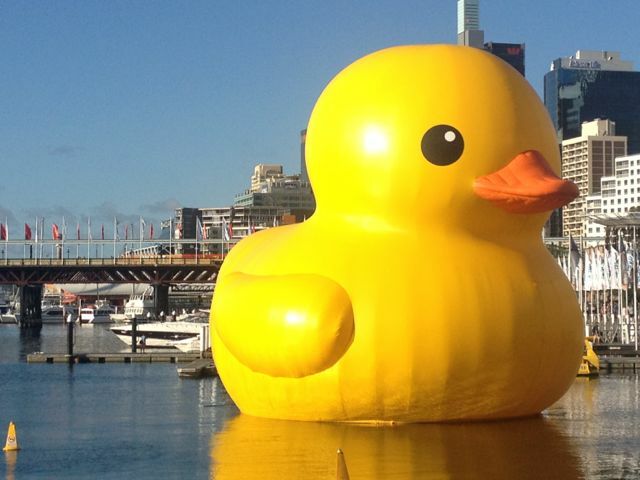 Rubber Duck has toured the world, but am sure he’s enjoying his current home in the very public bath tub of Darling Harbour. Brightening up the view for some city office workers. If you like ducks, sunshine, photo opportunities or smiles, this Festival event is well worth a visit. Rubber Duck is in town until January 23 – you can read more about the Sydney Festival and Rubber Duck here.